Discrimination in the labor force is a problem that economist are interested in and have done substantial research in. The inefficiencies created by discriminating against prospective employees based on factors not related to productivity damages the very businesses who engaged in this practice. Not to mention the undue burden of longer unemployment, less offers for an interview, and potentially less pay for groups who are discriminated against. Dr. Bertrand and Dr. Mullainathan from the University of Chicago conducted a randomized experiment where they sent close to 5,000 resumes to potential employers. The resumes were virtually identical except that some resumes had “black” sounding names like Lakisha or Jamal, while others had “white” sounding names like Emily and Gregory, they sent the resumes and waited to see how many offers for an interview were given to those people with black sounding names compared to white sounding names. They published their findings in the American Economic Review in 2004, in a paper titled “Are Emily and Greg More Employable Than Lakisha and Jamal? A Field Experiment on Labor Market Discrimination”. I have accessed this data from a popular introductory econometrics textbook, this post replicates pieces of their study for instructional purposes. As mentioned earlier the data were collected from Stock and Watson’s Introductory Econometrics website, http://wps.aw.com/aw_stock_ie_2/50/13016/3332253.cw/index.html, a detailed description of their research methodology and variables can be found in this link http://wps.aw.com/wps/media/objects/3254/3332253/datasets2e/datasets/Names_Description.pdf. What is the call-back rate for whites? For African American? Is the difference statistically significant? Is it large in a real world sense? 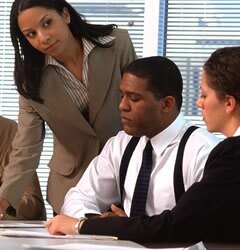 Is the African American/white call -back rate differential different for men than for women? What is the difference in call-back rates for high-quality versus low-quality resumes? What is the high quality/low quality difference for white applicants? For African American applicants? Are these differences statistically significant? The average call back rates for applicants with white sounding names was about 9.65% with a standard deviation of 29.53%. The 95% confidence interval for the average call back rates for applicants with white sounding names is between -48.22% and 67.52%, or essentially between 0 and 67.52% since a negative probability doesn’t have a mathematical interpretation. Applicants with black sounding names weren’t called back as often, only 6.45% of the time with a standard deviation of 24.56%. The 95% confidence interval for a call-back for a black applicant is between 0 and 54.57%. The differences between the call-back rate applicants with white and black soundings names are statistically significant, despite the overlap. In a real world sense, the probability of getting called back if the applicant had a white-name is nearly 50% greater than if the applicant had a white name. The table above ha the call-back rate for males with white sounding names and those with black sounding names. The difference in call-back rates favors those males with white sounding names by about about 3.04%. The table above compares the call-back rate for females with white sounding names to those with black sounding names. The difference favors the white sounding name by about 3.26% compared to 3.04% in the previous table for men, providing some evidence that the penalty for having a black name is greater for women than for men. Applicants with a high quality resume who had white sounding names were likely to get called for an interview 10.79%, but these same high-quality resumes were discarded more often if you had a black sounding name, as evidenced by the 6.70% call back rate for people in this category. The difference is statistically significant. Finally, a Probit regression also demonstrates similar patterns, and also adds a couple of more dimensions. After controlling for the number of of jobs on a resume, years of experience, special skills listed, college education and special items on a resume such as military, volunteer work, and honors people with black sounding names were 3% less likely to be called for a job interview than similar applicants with white sounding names. The results is statistically significant and supports the findings by the University of Chicago about racial discrimination in the labor market based on the ethnicity of an applicants name.